The Historical Society of Rockland County’s popular boat day trips to the TZ Bridge construction site return in 2017 the following dates: Thursday, June 8 (sales opening 10 a.m. on April 27), Wednesday, July 5 (sales open 10 a.m. on May 24) and Tuesday, August 15 (sales open 10 a.m. on July 6). Tickets go fast but if you get your hands on one boarding takes place the day of the event at Haverstraw Marina from 9:30 – 9:45 a.m. The River Rose, a Mississippi-style paddle wheeler, will return to the marina between 2 and 3 p.m. the same day. Departure and return times may vary slightly depending on tides and weather. The day trip costs $93 per person for Historical Society members and $98 per person for non-members. Tickets cover the boat ride, a guided tour and a box lunch. The Tappan Zee Bridge is the largest infrastructure project under way in the United States. The HSRC day trip gives attendees an opportunity to observe this undertaking from a unique vantage point. 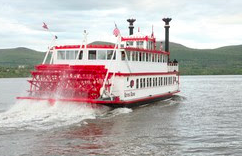 Join us on theRiver Rose, a Mississippi-style paddle wheeler, as we cruise along the Rockland shore of the Hudson River to the Tappan Zee Bridge. Participants will view the current bridge construction from vantage points that are as near to the bridge as legally and safely as possible. Narration and commentary will be provided by historians from the HSRC, as well as by leaders of the current bridge project (availability and conditions permitting). The guides will also be available to answer questions about the past, present and future of the Tappan Zee Bridge. On the return trip, attendees will be treated to a cruise along the Westchester shoreline.